Key Points ➤ Mechanical ventilation is a life-saving intervention, but it is also associated with complications. Therefore, it is desirable to liberate patients from mechanical ventilation as soon as the underlying cause that led to the mechanical ventilation has sufficiently improved and the patient is able to sustain spontaneous breathing and adequate gas exchange. 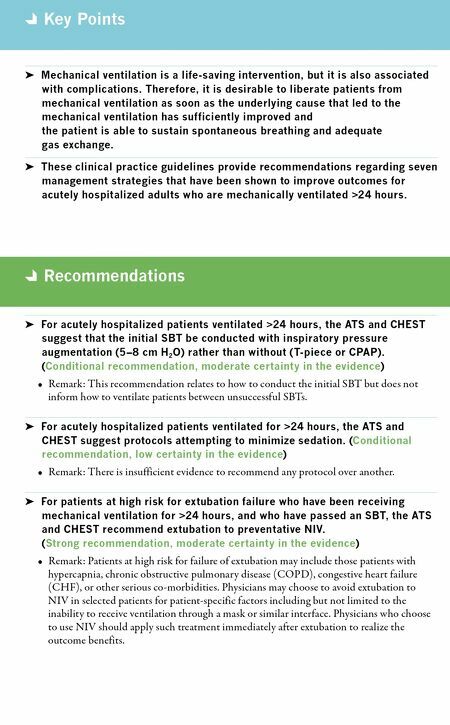 ➤ These clinical practice guidelines provide recommendations regarding seven management strategies that have been shown to improve outcomes for acutely hospitalized adults who are mechanically ventilated >24 hours. Recommendations ➤ For acutely hospitalized patients ventilated >24 hours, the ATS and CHEST suggest that the initial SBT be conducted with inspiratory pressure augmentation (5–8 cm H 2 O) rather than without (T-piece or CPAP). (Conditional recommendation, moderate certainty in the evidence) • Remark: This recommendation relates to how to conduct the initial SBT but does not inform how to ventilate patients between unsuccessful SBTs. ➤ For acutely hospitalized patients ventilated for >24 hours, the ATS and CHEST suggest protocols attempting to minimize sedation. (Conditional recommendation, low certainty in the evidence) • Remark: There is insufficient evidence to recommend any protocol over another. 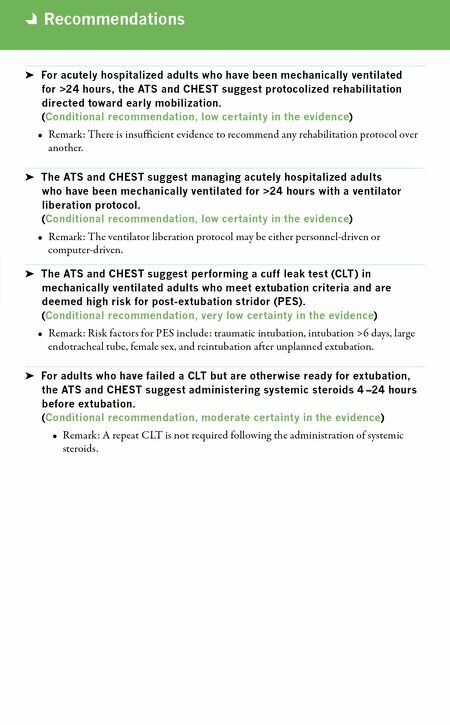 ➤ For patients at high risk for extubation failure who have been receiving mechanical ventilation for >24 hours, and who have passed an SBT, the ATS and CHEST recommend extubation to preventative NIV. (Strong recommendation, moderate certainty in the evidence) • Remark: Patients at high risk for failure of extubation may include those patients with hypercapnia, chronic obstructive pulmonary disease (COPD), congestive heart failure (CHF), or other serious co-morbidities. Physicians may choose to avoid extubation to NIV in selected patients for patient-specific factors including but not limited to the inability to receive ventilation through a mask or similar interface. Physicians who choose to use NIV should apply such treatment immediately after extubation to realize the outcome benefits.